The film focuses on a young unemployed working‑class family and their everyday struggle for survival. The family is like any ordinary European family, trying to make a living with the work of their hands. Due to the global economic crisis their life ends up in a blind alley. Everything looks as if there is no way out. Those individuals cannot fight against injustice, misery, the unseen authority of the capital... However... Granite cubes, torn out of streets, are waiting... Have waited... For centuries. Inferno exists. But only temporarily. Omnibus "Equals" is comprised of six individual stories of children growing up in harsh circumstances, robbed of their right to a carefree childhood. They fight to survive in different ways. While some of them battle poverty in the streets, becoming juvenile delinquents or victims of human trafficking, others face daily discrimination, abuse in their families or lack of access to treatment or cure for their ailments. These little heroes cross paths, in bizarre ways, with adults who are charged with their care, whether as parents or teachers, but also those who just happen upon them during their daily grind, or in crucial moments in their own life stories. In a small and poor village in Bulgaria, located close to the border with Turkey and Greece, Mityo loses his job and is forced to accept to work for his former commander in order to keep his house and pay his loans. His job is to smuggle illegal immigrants from Syria through the Bulgarian-Turkish border into the EU. Since the death of his wife, the relations between Mityo and his son are strained. The revelation of a terrible secret will force Mityo to face the past, in order to regain his internal peace and find forgiveness from his son. 18.00-19.30 / Round Table - "Europeanisation of the Balkans or Balkanization of Europe"
Story about youth of two brothers: in the same night - older brother, Stanko (30), is going to kill a man for a first time and his 16-years brother Vojo is going to make love for the first time. Many things between two brothers will cross them on that important night, and - will review the meanings of terms: family, trust, youth, loyalty and priority. What seems to be easy it is not at all at Balkans... and what is the price of being filled with satisfaction? Nikola Vukčević is a Montenegrin film director, born in 1974, in Titograd (Socialist Republic Montenegro), in Yugoslavia. He graduated as Stage and film director, independent producer since 1995, member of Film board of Montenegrin Academy of Sciences and Arts (CANU), and professor at national Faculty of Dramatic Arts – Cetinje. Also, Artistic director at City theatre Podgorica, since 2004. Vukcevic worked as the director/ author in around 80 projects, including one feature film (A View from the Eiffel Tower, presented at around 30 international festivals), ten theatre performances, (performed and awarded at a number of important festivals, i.e. Budva Theatre City, Infant, Exit, TIBA, etc.) He also directed four short films, 25 half-an-hour documentaries for Montenegrin Broadcasting Service TV CG, as well as numerous music videos, commercials, TV clips. Since 2004 - Vukcevic is at the position of Artistic director of City Theater Podgorica (second important theater in state of Montenegro, after its National theater), and artistic head of new productions, with more than 25 stage productions in charge. Vukcevic is well versed in the use of modern cinematic technology, a skill he learned through collaboration with experienced production and post-production crews (including Arkadena – Slovenia, Vizije – Croatia) as well as through attendance of international festivals, workshops and training sessions. Nikola Vukcevic has been named an Ambassador of Montenegrin Culture by the EU's Directorate General Enlargement. The Directorate is a project set up to promote the countries applying for membership of European Union, and the Ambassadors of culture will represent their country during the accession. His second film - 'The Kids from the Marx and Engels Street' by the selection committee of Montenegrin Ministry of Culture - is official Montenegrin national Oscar candidate for The Best Foreign film 2015. Education. Vukcevic received a Bachelor of Arts in Film and Theater Directing from the Academy of Arts Novi Sad, Yugoslavia, studying under supervision of internationally acclaimed film and theater director Vlatko Gilic (films on Cannes film festival – 1973, 1977, 1980; Berlin, Oberhauzen, Moscow, New York...), as Student of Generation 1998 from Drama section. Vukcevic has been included in category of the best University students in Novi Sad. In June 2001 he received a Master Degree of Arts in drama. His thesis was awarded and published as a book "I Influence of Film On Theater of New Forms". A run-down hotel room, a piano, a maid and the guests who stay there. Life begins, life ends, and lives are changed forever in the piano room. The Piano Room is a fable about the destinies of the guests who stay in the room with the piano in the hotel that is up for sale. This room, that hides them from the hypocrisy of the world outside, is the only place where they can find some kind of fulfillment. Although far from similar, as representatives of completely different social and cultural groups, all share emptiness in their life. As the years pass like revolving doors, motives become frustrations, ambition and fantasy lead to ruin. Only the Maid, oblivious to the thwarted dreams that check in and out, seems to move forward. Vlatko Gilic was born in Podgorica. He graduated from the Faculty of Architecture, University of Belgrade. Gilic is a professor at the University of Novi Sad, Academy of Arts, Department of Directing and professor at the Faculty of Fine Arts in Cetinje. University Senate, Rector's Collegium, University of Novi Sad, conferred the title of the Professor Emeritus on Vlatko Gilić. For his feature-length and short films, that he writes the scripts for, he has received numerous awards and honors at many national and international film festivals. "The Runner", dir. Toma Zidić, Slovenia, 5.40 min. "Sido", dir. Tamara Kotevska, Macedonia, 11 min. "The Mediterranean", dir. Yigit Pehlivan, Seckin Yalin , Turkey, 2.26 min. "Dinner For Few", dir. Nassos Vakalis, Greece, 10.09 min. "SOS", dir. Ufuk Erden , Turkey, 3.29 min. "Audition material", Gjorce Stavrski, Macedonia, 14.56 min. "Whisky and milk", dir. Miroslav Mandic, Bosnia and Herzegovina, 25 min. "If", dir. Florenc Papas, Albania, 17.48 min. "Tranquility of blood", dir. Senad Sahmanovic, Montenegro, 21.30 min. "The Man Who Fed His Shadow", dir. Marios Garefos, Greece, 17.44 min. “Love Bus” is an omnibus film composed of five different episodes, each of them taking place in a different district of Bucharest, Romania. After two years spent as a student in Boston, a 22-year-old visits his native Moldova. It is April 2009. People gather in the streets of Chisinau, the call having spread through social networking sites. They are demonstrating against the communist authorities who falsified the election results. They seize and plunder the parliament and presidential buildings. The demonstrators carry away documents, furniture and office equipment. Our protagonist is coming from a friend's home carrying his own computer monitor. He is mistaken for a demonstrator, brutally beaten up by the police and taken to the police station. His interrogator is an experienced major. The authorities can do anything. Based on real events, the film asks questions about freedom, justice and the price of human life. "Aladdin and The Magic Bin", Zikica Jovanovic, Serbia, 06.30 min. "Adana Kebap", dir. Özgür Barut , Turkey, 16.27 min. "Elmando", dir. Anton Octavian, Romania, 3.23 min. "Ratiocination of Privilege", dir. Metin Vatansever, Turkey, 7.13 min. "Seesaw", dir. Mina Cvetinović , Serbia, 7.10 min. "Because of my mum", dir. Antoaneta Chetrafilova, Bulgaria, 12.17 min. "Miriam", dir. Majlind Samadraxha, Kosovo, 19 min. "Wire", dir. Kiril Karakash, Macedonia, 11.46 min. "Symposium", dir. Ermela Teli, Albania, 7 min. "Diving-In", dir. Simon Intihar, Slovenia, 15 min. "Balcony", dir. Lendita Zeqiraj, Kosovo, 20 min. "I love YU", dir. Irena Skoric, Croatia, 15 min. "Radio", dir. Marko Crnogorski, Macedonia, 10.16 min. In 1986 a cancerous wind blew towards Trabzon from Chernobyl. It was followed by a wind of “Natashas” a few years later. Battered by these gales, Trabzon would never be the same again. Cemal(30) and his wife Ayşe(25) live happily in Trabzon with the break-up of the Soviet Union, Russian women immigrated to Trabzon to work. Among them is Olga,who falls in love with Cemal, when he rescues her from the hand of mobsters. Olga tells Cemal thar her great grandfather immigrated fron the nearby town of Santa to Yalta. She shows him photo of her great grandfather’s house which happens to be close to Cemal’s own house.Astonished they fall in love. Ayşe begins to suspect Cemal.One day she goes to visit Arif Usta (70), Cemal’s so-called “master” and here she runs into Olga. Cemal is shocked to see them together. The film "The Bridge at the End of the World" deals with the unfortunate human destinies from the war in Croatia. 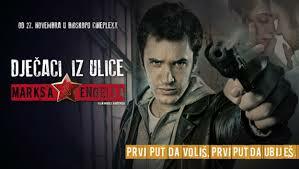 In fear of the return of Serbian refugees to their houses in which they lived before the war and that in the meantime populated with Croat refugees from Bosnia, an old man disappears, and the investigation that starts from a police officer who lives in Serbian house, will become more personal. Maria and Loukas decide at the same time and for no apparent reason to respectively run away from their homes. Each of them has to deal with their personal problems: Maria is stuck in a wealthy marriage with Dimitris while raising their two children. Loukas is unemployed and full of debts. Both of them begin wandering in modern day Athens. They come across a series of controversial events and meet with strange characters. Furthermore, various people seem to be on their track; Maria is followed by two policemen. Loukas is followed by a weird stranger dressed in black, Joseph, who desperately wants something from him. Tradition and existence of tambourine and tambourine music in Macedonia or rather in Kumanovo region has existed for centuries, but it is especially developed in the 20s of last century or more precisely in 1917 in Kumanovo, when worked great Tambourine Orchestra. The tradition continues somewhere in 1989/90 wahen new Tamburine orchestras were formed, from which to this day still exist "Kumanovski Tamburashi" to preserve and continue the tradition of playing tambourine and singing traditional songs. First very popular newly created composition for tambourine was written by composer and arranger Miodrag Bozinovski – Mico, with the lyrics of Ljube Cvetanovski, performed by Nino Velickovski and "Kumanovski Tamburashi". Song titled "I played mandolin" short became a hit and trademark of Kumanovo Tamburashi. In the past 10 years the orchestra Kumanovski Tamburashi actively works on creating and recording new songs and remakes of old Macedonian songs in new arrangements. Kumanovski Tamburashi performed at almost all relevant festivals in Macedonia, but also in Canada (Toronto), France (Paris), Czech Republic, Austria, Slovenia, Croatia, Serbia, Bosnia and Herzegovina, Montenegro, Bulgaria. They have recorded 5 albums, published on CD and won many awards at prestigious festivals. Kumanovski tamburashi and Nino Velickovski are founders of the International tambourine festival, which for 11 years successfully is organized in Kumanovo, R. Macedonia.